The basic idea is that sometimes children, even babies, need to cry — without being soothed or cajoled or fixed — just to let out those intense emotions. As an attachment parent to a high-needs baby, I was dubious. Crying-in-arms sounded awfully similar to crying-it-out to me. Plus, I disliked Solter's implication that comfort nursing was damaging and would result in using food as (inappropriate) comfort as the child grew older or into adulthood. I believed then, and still firmly do, that that is one of the natural functions of breasts and has been used by many cultures, without detrimental effects. I checked out the book and skimmed it but remained skeptical that I would be able to implement it in an attachment-acceptable manner. 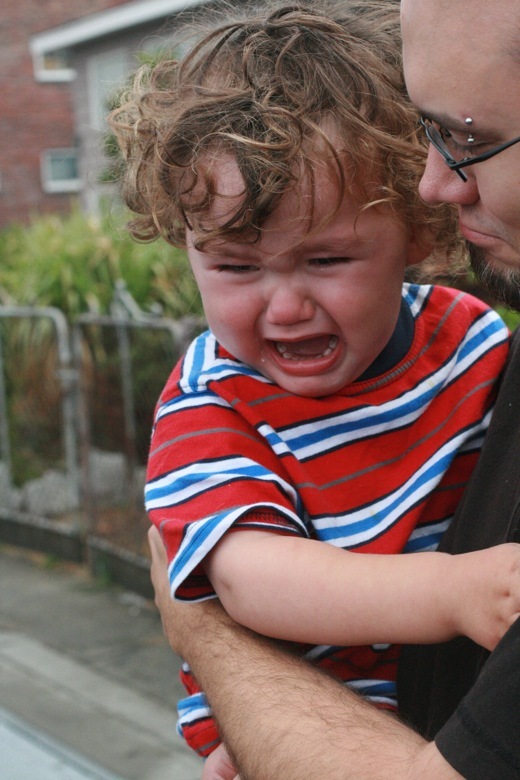 How could I let my baby cry and not be letting him cry it out? The idea is to meet any needs your baby has first, but then if crying continues, just be present with your baby — not bouncing or shushing, just gazing lovingly into his face. Hmm, I thought. I wasn't so sure about that. How could I know for certain that my baby didn't have needs still to fix? For instance, what if his need was for being bounced and soothed? But, gradually, I read posts by people like Lisa of My World Edenwild, who explained to me that "Crying is not bad." And so I opened up to the idea a bit more. I still didn't do anything about it, but I kept thinking of it now and again. Well, fast forward to our combination fourth-birthday party/meet-the-baby shindig for my two boys last month. 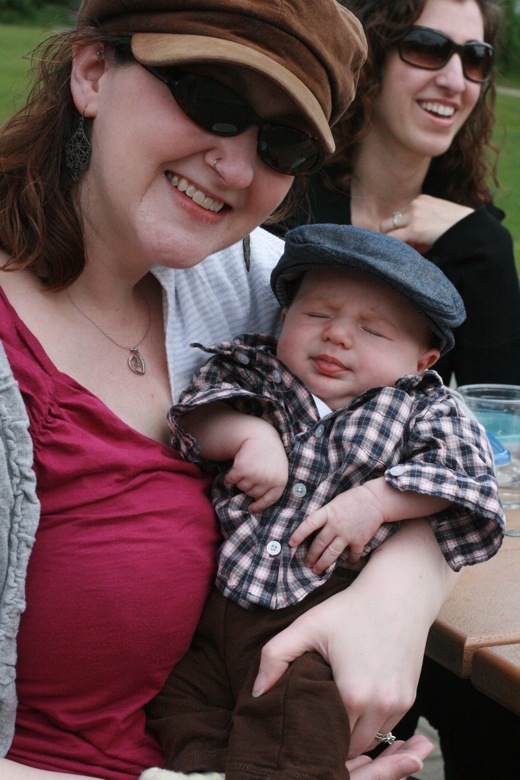 Alrik was the itty bitty star, of course, in his dapper old-man hat and H&M plaid shirt (I indulged). He got passed around, and around. And around. I held him a few times, to nurse, but then he was off to another set of arms. I relished it, though, this connection in community, this seeming tribe surrounding me and loving on my baby. 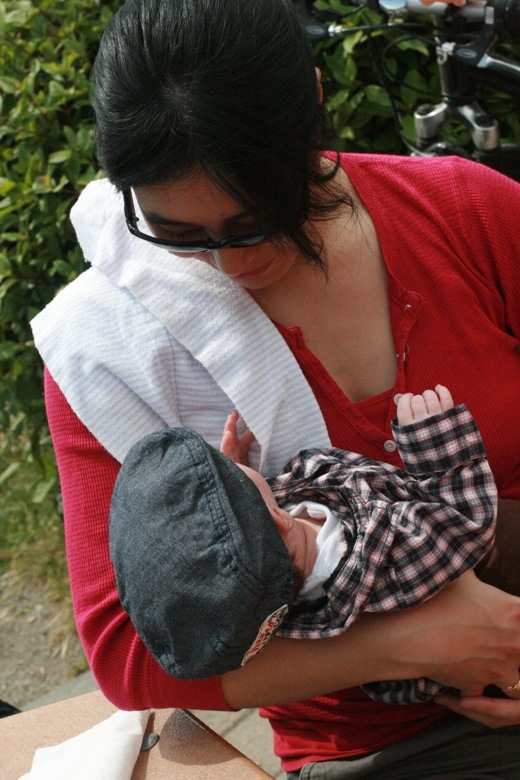 At some point, I started thinking: I should be holding Alrik more. Call it mother's intuition. But, well, he was popular, as I said, and I hated to spoil the fun. That night, though, he was the crankiest he had been in a long while. And I just kept having this thought that he was cranky because of lack of connection throughout that day — that his little primate brain was signaling that he needed to feel reattached, certain of our bonding, and he was expressing it the only way a newborn knows how: by crying, inconsolably. I checked that he was dry. I checked that he didn't need to pee. I checked that he had eaten, and burped, and eaten and burped again. I bounced. I walked. Sam did the honors as well. Nothing doing. Finally, up in our bed, the two of us alone, mother and baby, with nothing to lose, I went online to refresh my memory of the procedure for aware, in-arms crying. Was I supposed to do something? So: Just hold him and gaze lovingly into his face and tell him it was all right to cry? Well, ok, then. So I did. And minutes later, maybe seconds, he calmed. He settled and snuggled into me and fell asleep. I wasn't sure if it was just coincidence, but it felt good, and right, and like the best thing I could have done in that moment. I read some more about the whys and wherefores of letting babies release tension in this way, and one of the stated benefits was that if children aren't allowed to be emotional when they need to be, all they do is store it up and release it over and over again, probably at an even more inopportune time. One thing I read suggested that if your child is frequently breaking down over "trivial" things (trivial to you as an adult, of course, not to the child), it might be because they're repressing emotion about something bigger and it's bleeding through in short bursts as they're unable to hold it all back. Unfortunately, children are not always able to articulate what is stressing them out. Parents may think their child is overreacting to some small thing in order to manipulate them into getting their way. Or a more compassionate parent may view their child’s behavior as a reaction to a genuine need and try to fix it. Or they may just think their child is tired or hungry and deal with it that way. But having a tantrum over some small thing is what Solter refers to as the “broken cookie phenomenon.” Basically, when the child has reached her limit of stress, she will use anything she can to set the tears into motion. This might be something insignificant, like being given a broken cookie, and she will just have a tantrum over it. Not because she actually cares about the cookie being broken, but because she needs a premise from which to cry. This all sounded somewhat frighteningly familiar. 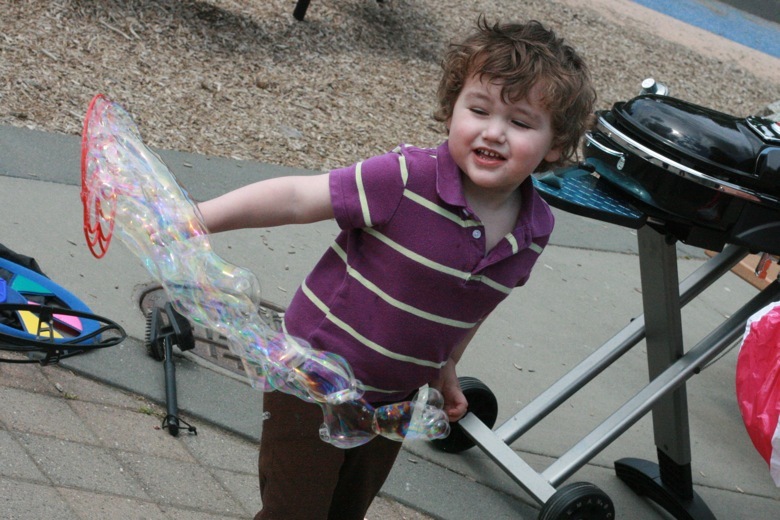 As Alrik was sleeping, I thought back to another event of the day: Mikko's balloon. Oh, dear. Not the balloons in question, but evidence that they have always been well-loved. Natalie had bought a bunch of balloons for the party, one of which was a mylar one with Happy Birthday printed on it. The whole bunch went home with us, but of course the shiny silver mylar was the favorite. 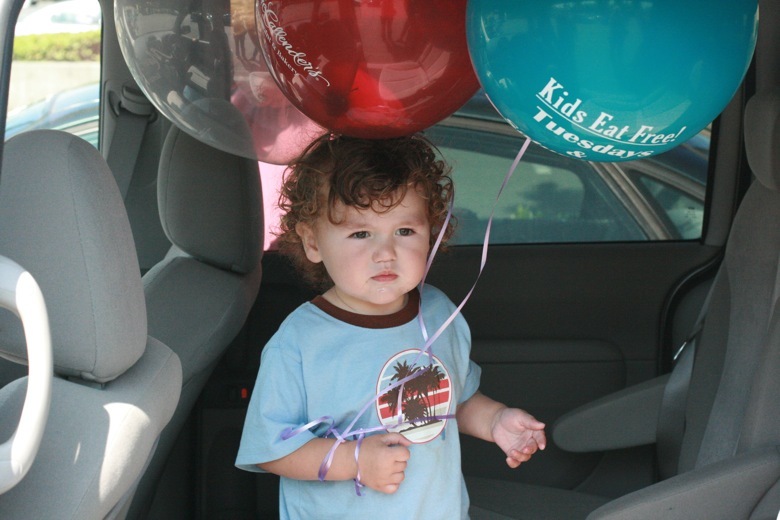 Mikko insisted on having that balloon poke out of the open car window as he was getting into his car seat (having things go half-out the window is a new and frequent request). Our friend (the track-ball pro) was helping him maneuver it when he noticed a fraction of a second too late that the ribbon attaching it was loose. Our friend grabbed for it, but — no luck — the balloon floated merrily and quickly into the sky. I had no idea it would go quite so high, so very irretrievably away. Mikko was despondent. For the first 10 minutes on the ride home, Sam and I were empathetic. For the next 10 minutes of sustained wailing, we were stoic. After that point, we were reasonable.3 "Your balloon is gone. Do you want a new balloon? We could go to the store if you want. No, we can't catch the same one — that one is too far away. There is no way we will catch up with it." After another 10 minutes where logic failed to have the desired effect of quieting our child, I grew sterner. "You need to stop crying about your balloon. It was just a balloon." Newsflash: This did not stop the crying about the balloon. So I was thinking over this scenario, and wondering what an "aware parent" would have done in the same situation. A day or two later, some triggering event happened. I don't even remember what it was, but it was the sort of four-year-old meltdown, like a broken cookie, that usually causes me to sigh and then attempt to reason, cajole, ignore, or coerce Mikko into knocking it off already. This time, though, this time: I stopped in my tracks. I went over to where he was crying fitfully on the couch. I put my arm around him and hugged him close and said something amazingly insightful (not really) like, "You're really sad about that. I'm sorry." So those are my two experiments lately with aware parenting — being present and non-judgmental during times of intense emotion. Being aware and present forced me into considering my own discomfort with crying, my kneejerk reaction to "fix" whatever is causing the crying rather than simply allowing it with compassion and without judgment or drama. This relates to how I deal with my own strong emotions, and how ineffectual I feel when faced with other adults' strong emotions as well. I realized I don't want to pass on this stuntedness to my children. I want them to feel comfortable with emotions, and unashamed at being sensitive — personally and in relation to others. So I am going to reread Solter's books — The Aware Baby and also Tears and Tantrums — to see what I want to take (and what I still want to leave — I'm all right with that as well). And since it's been such a small sample size of personal experiences so far, I'd like to continue to experiment with these techniques. I don't, for instance, want to use being aware and present during crying jags as merely another tool to cut their crying short (as in, "The last two times, staring lovingly into your face made you stop crying within minutes — what gives this time that you're upset for longer?"). I think it's been a good thing for me to consider, however. I can see now that some of my initial resistance to the idea of crying in arms was a resistance to crying itself — a perception that crying is bad and must be stopped at any cost. I can sense now that crying is both a release (as, seemingly, in Alrik's need to fuss before falling into a peaceful sleep on that occasion) and a means of communication — as in Mikko's request for me to come alongside him in his upset, not attack his feelings with solutions or disdain but merely be there and sympathetic. I think it will take some more practice, though! What has been your experience with holding and being present with your children while they release emotions? 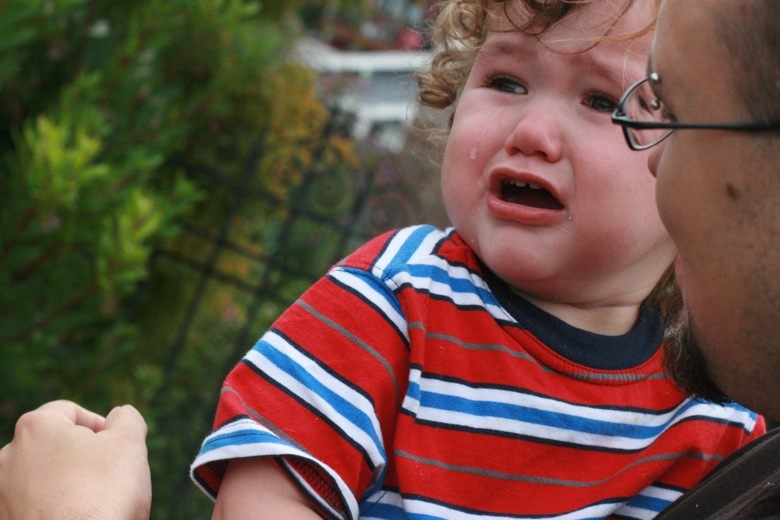 Are you comfortable with the idea that children, even young babies, might need to cry? Wonderful post! I needed that after my week last week! We forget that everyone needs a good cry sometimes (even us wise adults!) 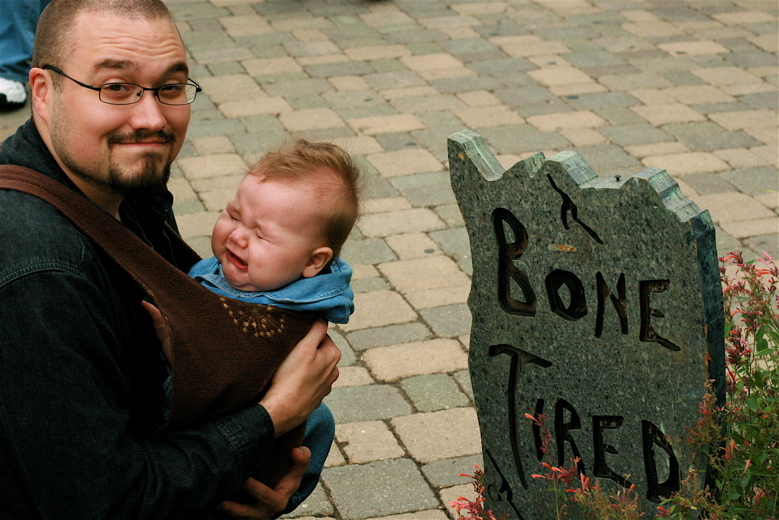 I recently had a similar experience with Baby T where he was crying hysterically for seemingly no reason. His chin was quivering and he was hiccupping uncontrollably with fat crocodile tears. When I finally gave him a kiss and said, "You're sad. It's ok to be sad. I cry when I'm sad too. You can cry as long as you need to, baby," he calmed down soon after. This is something I struggle with a lot. I become anxious when someone cries and am usually unsure how to respond. At times with my son I become frustrated and angry when he doesn't respond to my cajoling and this can lead to how I was treated growing up when I was upset. Needless to say this 'stuntedness' is certainly learned or more like I never learned how to appropriately deal with strong emotions myself. I want something more for my son. This post is especially helpful for me and I hope to incorporate into my parenting style pronto. Thank you! I'm so happy you shared this. I've read some similar arguments (different sources) about "crying in arms" as you call it. But I've never heard it from an explicit AP-advocate. How refreshing, sensible, and encouraging! In general, I try to allow my son to express his emotions, but the crying and wailing is sooo hard to cope with. Like you, I still think it's important to first consider unmet needs. It also seems important to consider that sometimes that unmet need is the need to express sadness, grief, longing, despair, fear, and anger. It's a big challenge for me to sit with him through those emotions. What do I say? What if he doesn't want to be held? I just try to imagine how I'd want to be treated if I felt that way. It helps, but it's still hard! I was really impressed by the sections of the book Playful Parenting that deal with this. I think many of us unconsciously train our boys to be stoic, to "brush it off" - we try not to "coddle" them. But this might just help create men who can't express their feelings. Who don't even realize they are HAVING feelings, because they just push them so far down. We want our boys to be able to express pain - physical and emotional. And in order to encourage that, we have to be okay with hearing them express their pain and frustration. This was a wake-up call for me, because my boy is naturally extremely stoic and rarely cries, even when he takes a tumble that would make my husband or I cry out in pain! So I realized, he doesn't need any more training to suppress his feelings - he needs the exact opposite. We need to ENCOURAGE him to express his frustration and upsets (the fact that he doesn't talk only makes this more important). That's a great book, btw. I hadn't liked other approaches to the crying-in-arms issue, until I read that book, and it really resonated with me. Love this post. You write in such a human and approachable way, I am so inspired by that! I have been on a similar journey myself from attachment parent to a baby who cried a lot to becoming very okay with kids' need to just express emotions. I know it works for me (sometimes I just need to cry and after I feel sooo much better) and I also relate to the broken cookie syndrome for myself, I remember once crying 'cos I broke a bunch of plates (as a waitress). They were just plates and I knew I really wasn't sad about that - there was just so much pent up tension and stress that it all came out then. That was the last straw! Thanks for your post. Re-posting. Oh, yeah... PS: love the photos. need to get more photos of my kid crying!! That first post of Mikko crying - amazing! Wonderful shot! I know some see a camera being whipped out at such an opportunity and think it cruel, but is it not important to capture all of the emotions for memory? I bet Mikko will appreciate this photo when he is an adult. I hadn't done much (if any) reading on "crying in arms," but had seen suggestions of just identifying a child's feelings during a tantrum. I think calmly identifying and validating a child's feelings and the reasons behind them is, in a way, still finding a fix - even if they still need to cry for a bit. You're helping them learn the words behind what they're feeling and supporting their feelings. "I know it is upsetting when you don't get your way." I say that a LOT. I was just thinking today that I should be using "mad" or "sad" instead of "upsetting," which I think is too vague a word. I want to comfort my child AND be present with her in her moment. But yeah, it is NOT easy a lot of the time. i'm so stoked on this post... i am super inspired by aletha solter's work as well - and i'm lucky enough to live in the same town as she does, where she teaches workshops regularly and have attended a few and loved them. such cute boys, by the way! congrats on the newest addition! I just wanted to say thank you. One of the things I've struggled with most as a parent and a person is how to deal with strong emotions, in myself and in other people. When I was growing up there were enough intense emotions pouring from other people in our house that I learned quickly to keep my own emotional responses in check and to act as the buffer and voice of reason. Now I have a hard time with having any kind of emotional response at all. Sometimes that can be a good thing - I do great in emergencies. Sometimes though I'm just at a loss on how to teach something I don't understand myself. How do I demonstrate empathy and acceptance of sadness and crying, or even intense joy, when I have a hard time feeling those things myself? Please keep us posted on what you find in your book journeys and how things work out for your family. I'm definitely all ears on how to make emotional responses more okay in our family! I had not heard of Aware Parenting before now. I think my daughter has taught me about it through her personality, though. As an infant, when she would cry and I tried to shush her, she would cry louder. I took this to mean, "I'm upset and I will not be shushed!". So, I've pretty much stopped shushing and I hold her and tell her I understand that she's upset when she cries. There are exceptions, like during a very long car ride this past weekend. We had a 10 hr drive ahead of us and because she was overtired from the previous day she was extra cranky. There was a lot of crying in the care and I did shush and try everything I could think of to quiet her. Of course, nothing really worked, she just had to tire herself out and go to sleep. I like the idea of crying in arms. It's a lot like listening to an adult "vent" about a problem. First of all, thank you for this! 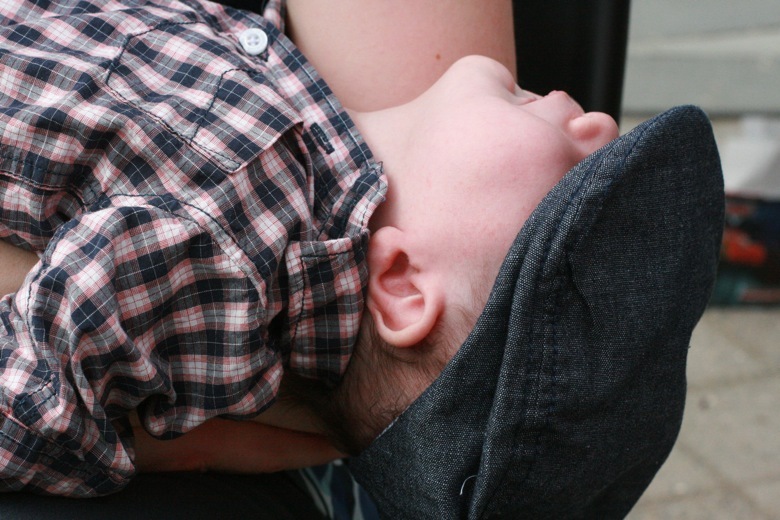 Secondly, I can really relate.... my oldest was a very high needs baby and after months of "colic" that past 6 months old cannot, in my mind, be called "colic" anymore, I slowly came to the realizations in this post. Sometimes I just needed to hold her and say sweet things to her and rock her back and forth until she worked whatever upset was in her system out of her system. Fast forward to my third baby and lo and behold I've come to the same realization. Sometimes people (like my MIL) say, "there must be something wrong... is she hungry, is she tired, is she _____ fill in the blank" and they can't understand why I'm not doing something to Stop The Crying. Well, I am.... I'm letting her rage against the machine, work it out, belt out the blues while I hold her and reassure her that I love her. Just last night my middle child was in an unreasonable (by adult standards) mood and raging against the machine. The only thing that made her feel better (after everyone else tried to figure out what was bugging her, to no avail) was to pick her up and say, "You're very sad," over and over to her as I stroked her hair. Sure enough, 10 minutes later and she was fine. And she loved the extra connection time. Thanks!! I LOVE your blog. I pretend we (you & I) are best friends. You've helped me so much to think through and to reinforce some of the ideas I've been wrestling with and newly confronted by during these past six-months of newparenthood. I definitely need this reminder that crying's good. I was so happy after baby was born and yet I cried. My midwife assured me that this is not necessarily a sign of sadness, say, but a way to release an overflow of emotion. Not good, not bad. Recently, in practicing asking for what I need, I recognize I'd like my partner to hold me while I cry--not to demand I tell him "what's the matter," or to be told to "shh." I try to remember this with my daughter. I know that there will be lots of times I can't fix it for her, and then I will assure her that I love her and I'm here for her. Thank you for sharing your journey, as you go. My little guy ends up doing this a LOT, unfortunately. I am pretty much never able to distract him or convince him to stop crying, so once I've acknowledged his feelings and reassured him that mama is there for him and that he'll be okay, I just walk him around and snuggle him. He usually wants to bury his head in my shoulder though which puts a damper on eye contact. Sometimes I feel like a terrible mom that I can't make the crying stop. Maybe I should read this book. I cry too sometimes and sometimes it feels good to get it out. Why wouldn't that be true of kids too?? What a great article, I love it!!! My kids are 9 and 14 and I was lucky enough to read the Aware Baby when I was pregnant with my first child. I've worked with these principles from the begining. They made absolute sense to me, fitting with my experience and knowing. As a healer and counsellor, as well as having spent years of the hard yards of healing the effects of severe trauma, I was determined to support my child's natural instincts to express whatever they needed to express and to show them that my love could hold all their hurts. The Aware baby described exactly this principle of applying therapeutic principles to the parent child relationship right from birth onwards. I later became a certified Aware Parenting Instructor and I help parents adopt these principles and it works beautifully. As others have said, I think empathy is the secret. I cried the other night because we couldn't go out for ice cream ... even though it was really because I was lonely and the one time I had left the house for days had been a total bust. Took me quite awhile of crying before I figured that out! Sometimes I just find it annoying and stressful when I'm upset and people try to "fix it." I wish they'd just let me be in a bad mood for a bit! With my son, I like to just hold him and say, "I know. I know." Or when he throws a fit, I say, "It's okay for you to throw a fit. I'll be here when you're done." He doesn't brighten up instantly, but it never lasts that long either. The reason I find this so important is that I have a friend who was raised by emotionally abusive parents. She was always punished for crying or showing any negative emotion. And now she's so out of touch with her own feelings that she can be upset for days, pick fights with people, etc., before she ever realizes she's upset. Luckily she has a boyfriend who will tell her, "Honey, you're acting strange. Are you sad/mad/upset about something?" I want my children to be able to recognize, identify, and deal with all kinds of emotions. It just might be the most important thing I teach them. Thank you for this post. I have trouble with intense emotion from childhood experiences. 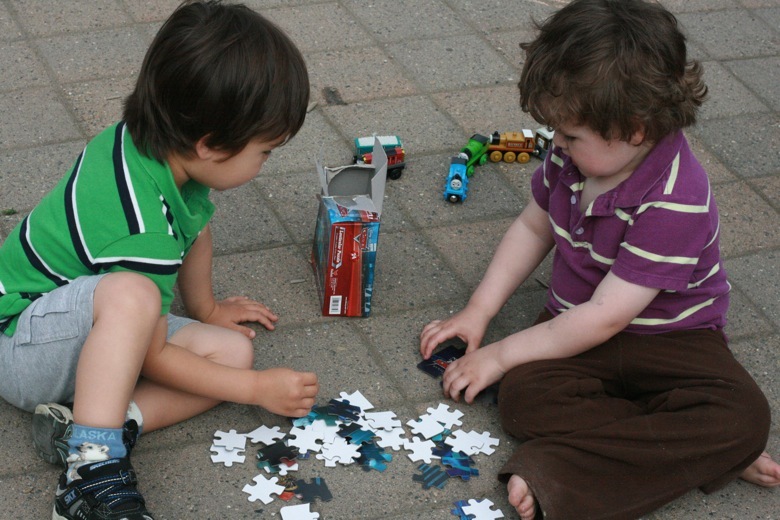 I have read about aware parenting and crying, but as an AP mom, it didn't seem right to me. Until I read your post and some of the reader's comments, I realize that it didn't resonate with me because I don't like crying! I have always felt extremely awkward around women who cry and rarely cry myself. Sometimes I think this is a good thing - I can keep my emotions in check and take the time to ponder what I'm feeling and learn from it rather than just crying and moving on without insight (following me? lol) But I see that there needs to be a better balance and I certainly want my high needs gal who finds the need to cry several times every day (!!) to be able to express emotion in a healthy manner. Thank you! What a great, thoughtful post. I have two daughters, now ages 9 and 11, and I have to say that, during my pre-teen's displays of intense emotion, I have to remember that her feelings are "bleeding through" and whatever she says is the issue, likely isn't. It is hard to sit with those uncomfortable emotions, but I think it is so important to work on developing an understanding of them and letting them have their "day in the sun" too. Fabulous post! I love how you describe the scenarios and how it played out. I hadn't heard it termed Aware Parenting before, but I've been doing the same technique with my children and have found it to be so powerful. Especially the "broken cookie syndrome." I had not heard it described like that, but instantly knew what you were talking about, and so often it is like that with our children - it's not actually about the cookie, it's a stress build up. I agree with you, too, that I am not quite as comfortable using this technique with infants, as I have found nursing to be very comforting, and I will not give that up or discourage that use of nursing. But, it is true, there are times, I think, when babies just get plain over stimulated, or just a lack of connection, in whatever way it is a build up of stress and comfort nursing will not work to soothe. In those cases, I would agree that this is a good technique, to be aware and present with baby, to be ok with crying. So many times we respond with stress in reaction to the crying, which should cause us to look inside at why we are responding that way! Some introspection! One challenge I have is when several children are doing a freak-out all at once. Those are times when I find it really hard to hold it together and be "aware and present." I tend to do my own freak-out with them, which is not helpful! So what to do in those times? Not quite sure! What a great post. That's two things I've read today that have actually nearly got me crying as I have realised how much I recognise from both applying what I've read and not applying it! Thankyou for being able to write it so well. YES. It's all about protecting and honoring their rights to feel whatever it is they're feeling. I always try to empathize that with Hawk (sometimes more successfully than others) and it's amazing how quickly he can process whatever it is that's going on. Just this morning he was whiny and impatient. I couldn't say or do anything that would please him so I stopped trying. I simply went about my morning while he sat on the floor and whimpered quietly (so sad, right??). After a few minutes I asked him if he'd like a hug. He said yes and climbed up into my lap. We sat there and I simply held him until he said, "Ok, I want to get down now." He was like a new child. He climbed up into his chair to eat the breakfast he'd previously been boycotting and smiled at me. Later he said, "Mommy, I know you love me because when I'm upset you hold me until I feel better." The point here, though, isn't that I'm Super Mom, but that whenever I let him feel whatever it is he's feeling and stop trying to SOLVE it he ends up working it all out on his own in a more meaningful way (to him, that is). Thank you, everyone, for sharing your experiences & thoughts! It's been lovely to hear from you all. I was rather nervous to publish this one, because I wasn't sure of the reaction. This is definitely a topic I'm still working through myself! @Inder-ific: I read Playful Parenting, but clearly I need to reread it, because those sound like great passages. It's really true that that's what our society expects of boys in particular. Mikko's already working on the "play it off" maneuver, which kind of shocked me at his age. @Leslie: "One challenge I have is when several children are doing a freak-out all at once. Those are times when I find it really hard to hold it together and be "aware and present." I tend to do my own freak-out with them, which is not helpful! So what to do in those times?" @Jessica - This is Worthwhile: "Mommy, I know you love me because when I'm upset you hold me until I feel better." I've really enjoyed reading everyone's comments in this thread, I think it's so important to have spaces to talk openly about crying and empathy because most of us grew up with just not enough of it, there certainly wasn't any from my parents, although my mother demanded a lot of it from me! My daughter (9) came out with a classic a couple of nights ago. She was upset and telling dad through her tears about how sad and "sore hearted" she's been because he's been away for a few days. DH: "I knew you were sad and missing me, that's why I brought home ice cream to help make you happy". DD: "that's food dad, how can food make me emotionally happy - thank you for buying it, but it doesn't make my heart feel better." Bless! What awareness and what commitment to having her REAL needs met. I thought about the times I'd told my hubby I needed empathy and he'd respond defensively by telling me all these things he was doing to take the pressure off because he knew I was having a hard time, but I haven't always had the clarity to say, "they're things, they can't make me emotionally happy". We've practiced Aware Parenting from the start (overall) and been committed to meeting the children's upsets with acceptance and empathy, rather than distracting them with food, drink or entertainment, or even breast milk when they were little, when it was clear that expressing the cry was what was needed. It's not always easy, when I'm frazzled myself, it takes huge willpower sometimes to slow down and open my heart to my kid when my cup is empty, sometimes I say "ok hun I can see you need me, I just need to take a minute to calm down myself". But I do it because I absolutely know it's what they need and deserve and I can really see the benefits especially as they've got older, they're so good at knowing what they feel, what they need and working to get those needs met. I find connecting through emotion so hard... ANd we're in a spot where there's a lot of huge emotion, and I know I should be reacting differently for my daughter to deal with them, but we get stuck in the same pattern, just because of my incapacity of dealing. It is so hard to overcome our own learned reponses to crying, after all, I bet we were mostly shushed and cajoled and possibly told off about crying. and so much worse for boys than girls, so it is doubly refreshing to see a mum of boys teaching her children it is okay to cry, okay to feel sad or frustrated and just let that out. In Naomi Stadlen's book "What Mothers Do (Especially When It Looks Like Nothing)" she describes a new mother who was having a hard time coping with her baby's cries without feeling it personally where her mother could cope much better and she described it as her mother letting the cry go through her (absorbing some of its force on the way) whereas it seemed to go *into* her and hurt. I've definitely seen that with my husband (his family is particularly emotionally disfunctional...even the women cannot deal with negative emotions at all); he cannot cope at all if our daughter cries, or is angry or anything other than calm and content. It goes into him and the child with unmet needs inside him rears up and hurts. I do seem to be able to just be with her, hold her if she wants to be held (she is 8 now and sometimes prefers space), listen if she wants that, just say "I am here" while she stomps or cries. I think this is a really fascinating topic, and totally under-researched/discussed. We had a very high-needs baby with no. 1 and no. 2 is currently going through a difficult phase - I've written a couple of posts on crying in order to work through some of the issues myself: The Crying Game and "I Want My Mummy: When Dad Just Won't Do". Great article! I've struggled with the social repercussions of soothing a crying child many a time (my middling is a high-needs child). It makes me feel good to know that maybe, someone in the crowded room understands why comforting is not the same as "spoiling". Oh my- this is a fantastic post. I just read it aloud to my DP. This gives us a LOT to think about. Thank you so much for sharing, and I would love updates! Great post! I read Aletha Solter's book a number of years before I actually became a mother, and I thought it made SO MUCH sense. I remember thinking at the time that she was describing exactly how I would like to be treated(with empathy and compassion and some time to get over the things that hurt me), and didn't it make sense to treat babies and children that way as well? I reread it when my son was a small baby, and, well, it didn't hit nearly as close to home the second time. I remember there being a lot of self-sacrifice type of stuff that really didn't sit right with me(though I really appreciated the chapter on conflict...come to think of it I made a mental note to return to that chapter once the toddler years were upon us. Here we go.). Not everyone has 3 adults living in their house to take care of one baby. Perhaps this self-sacrifice stuff is totally old hat to AP types (I am one myself, but I tend mostly away from internetting too much about it, unless it is expressly feminist...)At any rate, the basic premise seemed to fit seamlessly with AP to me, as I never have believed that AP was about avoiding crying at all costs, but about RELATIONSHIP and UNCONDITIONAL LOVE. Space to express yourself without someone attempting to 'fix' you for feeling what you are feeling is a big part of unconditional love, no? 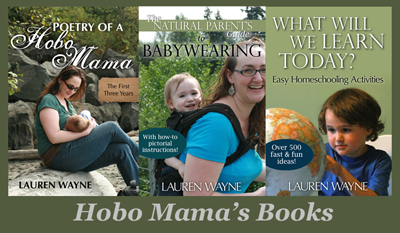 I will say, too, that I was inspired by The Aware Baby when it came time for nightweaning my son, which we did around 20 months. Long story short, we would actively try to console him for around 20 minutes when he woke up in the night(we cosleep) and after that we would tell him that we were going to sleep and he was free to join us when he was ready(having made sure ahead of time that the room was safe and secure). The comfort was ready and available to him and the power was all in his hands regarding making the choice to seek out comfort when he was ready. A variation on Solter's advice, I know. I came to realize(through MUCH conversation with my partner) that the crying he was doing during those times was so important to him: he was going through an intense transition in his life, and isn't that hard for anyone? Crying helps us to deal with the intensity of the situation, mourn for what is lost(in this case, nighttime nursing) and emerge ready to face the next step in life. Crying because you need to let out some intense and real emotions is nowhere near the same thing as crying out for help into an empty room and having no one come to meet your needs. It is our job as parents to facilitate this emotional maturation(leaving the past behind, facing the future)for our children, and in fact night weaning my son ended up being so easy that I am now convinced that I was cheating him out of the experience of maturing his sleep abilities because I was so afraid of his crying! Phew. Apologies for the epic comment. I have to tell you... my chest is tight and my eyes are brimming with tears right now - I NEEDED this post. I need to begin this journey and allow my little guy and others around me that freedom to just release what they need to release. I have so much more to say but I'm so heavy right now with conviction, I can't think straight. Thank you for this - gonna share it on the blog this week and gonna let it run through me like it needs to until it settles. These kinds of articles are life changing. They touch our heart and nudge our intuition and often that is needed. Our parents and their parents etc were encouraged by their experts to do exactly the opposite. Not many of us were ever taught how to trust our babies or our intuition, but when we see, read or experience something that plucks our intuition, we are often compelled to follow what feels right. I came to Aletha's book during my 4th pregnancy and lament that I had ignored it previously because I didn't like the cover! I've been a strong advocate of AP, co-sleeping, babywearing andbreastfeeding but until I read The AWARE BABY book. I did everything I could to stop my babies crying. With my last, although she was not as fussy as some of my other babies, every 4 days or so she would just need a cry. I would take her to a quiet room and just hold her in a relaxed way and love her and tell her "yes..yes..you need to cry...I love you...I am here...I understand" until she was done. I can hardly describe how right it felt. Sometimes the cry would last as long as 25 minutes, but it would reach a crescendo and then ease off to a releasing, 'complain' sounding something like "oyah oyah oyah". When finished she would either sleep peacefully and awake completely happy or be totally like "right...got that out of my system..lets get on with the day then, shall we?" She knew i was listening, present and loving and I knew she would cry for as long as SHE needed. It quickly became very easy to determine her 'need a cry' cry from all the others. She is now 5 and sometimes when I observe a 'broken cookie' meltdown...a little in arms cry still works like a charm. LOL, that song just says it all, doesn't it? Fantastic post, Lauren! (And I'm not just saying that because you quoted me, lol). So glad you were able to make this discovery with your children. I needed the refresher, too--lately I've been thinking of how well I dealt with Michael's crying when he was younger but now it's starting to irritate me, and I realized we haven't done the 'crying for comfort' in a while! I need to take my own advice, lol. Keep practicing, you are onto something Lauren. I Tears and Tantrums with my first and wasn't sure either. It wasn't until my subsequent children would not comfort nurse at the breast that I realized I had connected with a resource before its time. I say that because many parents initially find it difficult to be with the pain their children experience. It brings up our own pain and if we don't know how to meet it, we will try to squelch or children's in one way or another. We also have societal ideas about expressing emotions to contend with, but these are all tied in together with what we believe about pain and our emotional pain we have not been able to accept, breathe through, work with, express respectfully, etc.